Our tour guide Gary was great he was very informative. The Segways were fun and easy to use. Savannah is a beautiful place. This team took us rookies through our initial trepidation around riding a Segway for the first time and we felt so comfortable after their great orientation. The tour itself was a perfect balance of history education and humor and fun. Just the right amount of stops and great pictures. Thanks so much! My husband and I went on a Segway tour last week in Savannah with Rose as our tour guide. It was our first time on Segways and once Rose gave us our overview, we got on the segways and took off--easy peasy. Rose was a great tourguide and had great stories to entertain us with and was very careful to keep us out of traffic and away from cars. Highly recommend the Segway tour especially with Rose as your guide. We loved it. It was our first time on segways and we would definitely do it again. Great fun, beautiful scenery and if you never been on a Segway it is a must do at least once in your life. As first time Segway riders, Mary made me and my wife feel safe and confident in riding segways in the streets of Savannah. 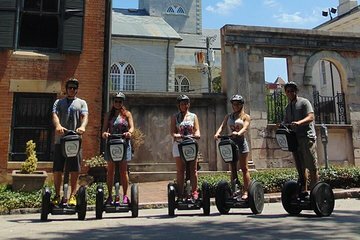 I highly recommend this tour to anyone wanting to tour Savannah's historic sites via Segway. As a first time Segway rider, I can tell you, do not be afraid. This was so much fun. Crystal was our leader, and she was great, not only as our momma duck, but also with her knowledge of the city and its history. This is a great city for your first Segway experience because the traffic is slow and you can safely share the road with the vehicles. Well run tour. You will love it. Beyond the highlight of riding a Segway for the first time, we were amazed at the tour guide, Crystal, and her helper, Lisa, and the knowledge of acclimating us to the historic district of Savannah. As seniors riding on a Segway was on our bucket list! Crystal does an excellent job of training you to ride SAFELY! Her knowledge of the area is superb. A great adventure to do at the beginning of your trip to Savannah. Introduces you to Forsyth Park, Mrs. Wilkes, Cathedral of St. John the Baptist, etc. Our guides went out of their way to give us further information and recommendations following the tour. If you don't bring bug spray and you need it in Savannah, they will supply you: A MUST tour!!! This tour was great. The guide Mary was very informative and I love using the radios. Great for communication. Segway are so fun. I would do this tour over and over again fabulous.